Today I thought to share two photographically orientated websites with you. The first is the the Encyclopedia Britannica Blog’s post “2010 in Pictures” which takes a handful of the international stories that made headlines in 2010 and shares an image for each. 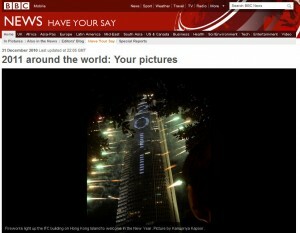 The other website to check out is the BBC with their “2011 Around the World: Your Pictures” gallery that brings the images of the new year coming in from all over the globe. Again, its just a handful. We hope you had a great New Year celebration and look forward to sharing in a great 2011 with you. Don’t be shy to share your favourite websites with us too.